I don't mean to give away any spoilers here, just in case you're planning on coming to my latest theatrical venture, but there was need for a giant squid for this show. Feeling ever-so-crafty, I volunteered to make the squid. 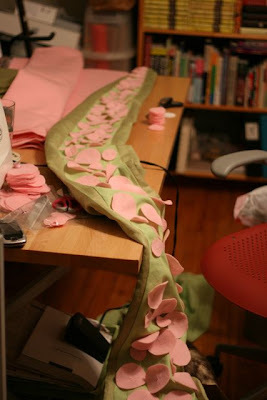 The tentacles are 10 feet long each. 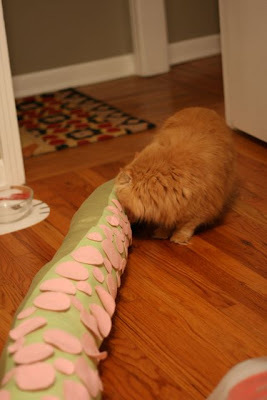 I stuffed the tentacles with (two each) five-foot-long floating noodles, because they provide flexible structure, and padded with polyfoam. 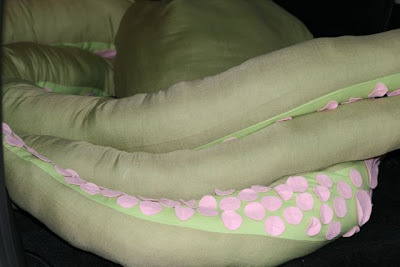 There are approximately a hundred suckers on each tentacle in four different sizes, crafted out of pink felt with a single tight stitch in the center of each to give a puckered effect. The budget for the squid was about $50. No patterns here, I just winged it. I think the squid turned out pretty well if I do say so myself. I feel a call to start making props for movie and theatrical productions. Marigold wants to know what kind of freaky pet we've adopted now. Finished and headed for the show!